The Legend Of The Weresheep is a Side Quest in Divinity: Original Sin Enhanced Edition. This quest is started by reading the book "The Legend Of The Weresheep" which you can find in a mound by the old church in Cyseal. 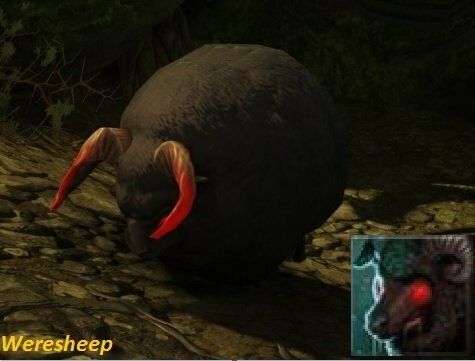 What is a weresheep? That is what the quest is all about. NOTE: Pet Pal Talent is required for this quest. The book "The Legend Of The Weresheep" can be found in the graveyard, to the West of the old church in Cyseal. You can see a small mound (if you have high enough Perception). Using a shovel on it will discover the book hidden there. Read the book to start the quest. Inside Boreas's Treasure Room in Hiberheim Castle, you can find on one of the tables a note labelled "The Last Weresheep". Read it to update the quest. Next you need to speak with the ghost of the Weresheep. You can find the ghost inside Maradino's Cave. It will appear once you dig up a mound. You will need to have Pet Pal Talent to speak with it. In the laboratory in Maradino's Lair, you will find a note called "Weresheep Recipe". Read it to find out that the Weresheep likes Stardust and that its body will be found in the Dark Forest. Option A - Kill it. Optioin B - Convince it to give you the wool. If you lose the game, you will still have to fight it. To complete the Quest, head over to the Elemental Forge in Hiberheim and use the Weresheep Woo with the Forge to craft yourself some weresheep armor.